Can the Sagas be Trusted? The sagas are written in such direct and simple words that they were originally considered to be accurate, objective observations made at the time of the events they describe. But, about sixty years ago saga scholars began to realize that the situation was not straight-forward. The literary qualities of the sagas were brought out. A view began to spread that the sagas were simply literary fiction, in part patterned on medieval novels from continental Europe. Later still, a new view appeared which falls somewhere between the former two. Although portraying Viking Age events, the sagas were believed to reflect customs, material culture and events from the time they were written down, after the Viking Age. Now, new historical and folkloristic research has shown that there is a true Viking Age core to the sagas but that 13th and 14th-century political and personal considerations have affected their content. Many believe that it will never be possible to sort out fiction from facts in the sagas. This is where archaeology enters into the discussion. Archaeologists have begun comprehensive investigations in Iceland, assembling a wealth of information on architecture, material culture, lifestyles, economy and the environment. It is becoming obvious that much of what the sagas tell of the Viking Age corresponds to reality. However, it is also clear that they are not straight-forward accounts. Some events are out of order. Their flow has been simplified so that as much may be left out as is described. In some case, two or more locations may be combined into one, and here and there names have been confused. The oral traditions on which the Vinland sagas are based can be seen in the format of the stories. Sentences are short and simple. Certain expressions are repeated, ‘Leif then spoke...” The order of events is shifted as the thoughts of the story teller drift onto another topic. For example when the Norse capture two boys on their way back to Greenland, the story of what happened to them in Greenland is told before the description of the actual return. All Icelandic sagas have one peculiarity in common: the compass directions given from one place to another are unreliable. 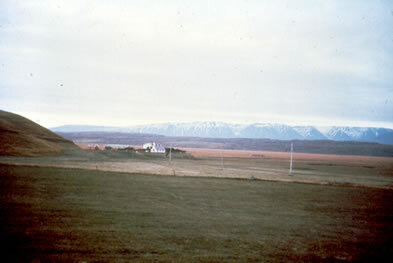 One saga scholar has pointed out that in the Snæfellsnes district of Iceland, where "Eirik the Red’s Saga" was probably first compiled, ‘south’ means ‘east’, and is still used that way there. There is confusion also in the rest of the sagas. If one reads them with a map of Iceland at hand and compares the map with the sagas’ descriptions of the directions of travel, one finds that almost all are wrong. Such details compound the mystery of the location of Vinland. "Eirik the Red’s Saga" is an example of how Icelandic saga writing was affected by later political and personal agendas. In the 13th century there was a movement afoot to have Bishop Bjorn Gilsson declared a saint. This bishop, a direct descendant of Thorfinn Karlsefni and Gudrid, had died in 1162. In support of the application for sainthood, it had to be shown that the bishop had virtuous, prominent and outstanding ancestors. This may be why the story of Karlsefni and Gudrid has become more grandiose and significant than related in the "Saga of the Greenlanders". Also the "Saga of the Greenlanders" has some distortions. 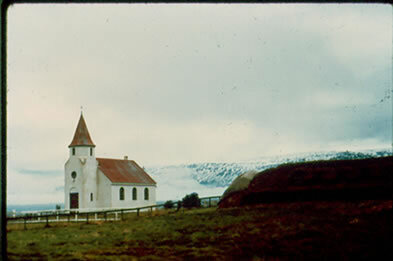 It tells us that Gudrid and Karlsefni settled at Karlsefni’s estate Glaumbær in northern Iceland where Gudrid established a nunnery. Other records indicate that Karlsefni’s estate was not at Glaumbær but at Reynisnes. 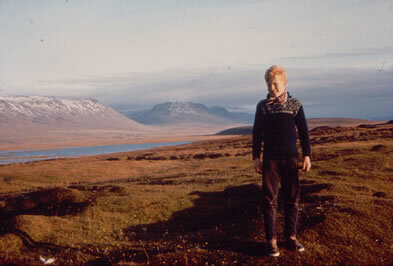 However, in the 13th century when the Saga of the Greenlanders was compiled Glaumbær was more important. Sometimes the wording of the sagas carries more information than appears on the surface. When Leif said in the "Saga of the Greenlanders" ‘Now I am going to name this land’, it does not just mean that he invented a name. Such name giving was in fact a formal land claim. By giving Helluland, Markland, and Vinland their names Leif claimed these territories for himself. When Leif is willing to lend his buildings in Vinland to the leaders of the other expedition but not give them to them, he means that Vinland is his and the others must give him a share of the profit derived from this land.